Zippers actually freak you out a little, don’t they? Especially the invisible ones. I am here to tell you that if you follow my suggestions, you are going to fall in love with love invisible zippers. I guarantee it! Keep the garment as flat as possible. That means for the Emily Culottes, do not sew up the right side seam yet, and do not sew the left side below the zipper. Use an invisible zipper foot specifically manufactured for your machine. Do not waste your money on the generic foot; lots of garments need zippers and this foot is worth every penny. If you do not have one or cannot get one, you can use a regular zipper foot, but you will need to practice to find the EXACT placement of the stitching. Too close to the teeth and the zipper won’t open; too far away and the zipper tape will be visible. Start with your stitching 1/8 from the teeth. Use a basting stitch and practice to find the best placement. Interface the stitching line of the seam allowance before inserting the zipper. That super-firm twill tape the zipper is attached to needs to be stitched to a very solid fabric base, or the fabric will ripple over the top of the zipper. 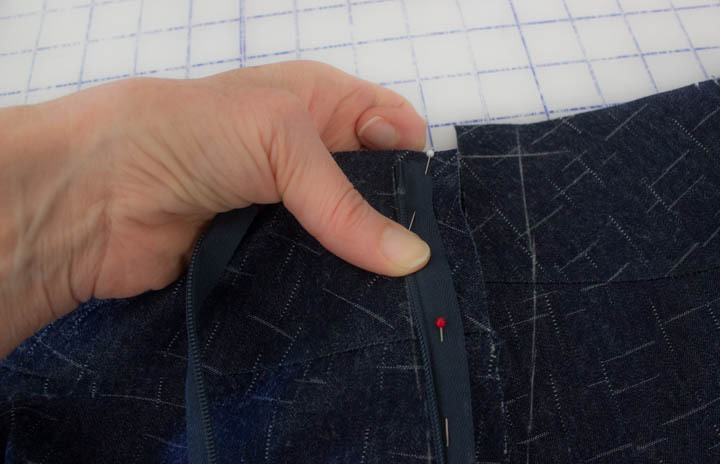 Cut strips of fusible interfacing about 3/4 of an inch wide (vertical grain), and fuse to both sides of the left seam allowance of the zipper area. Make sure the interfacing covers the stitching line. Clean finish the zipper area seam allowance and the seamline below the zipper area before you insert the zipper. ( I serged my seam edges) It is too hard to get into this area after the zipper is in place. Mark a chalk line on the right side of the fabric 1/8 + the seam allowance from the raw edge. For your Emily, that means 7/8 of an inch (1/8 + 3/4 = 7/8). Line up the zipper teeth on this chalk line. Position the head of the zipper pull at least 1/4″ below the waistband/facing seam allowance, and a bit more is better. This allows for the “turn of cloth” when the yoke lining and seam allowance is turned to the inside after stitching. The thicker your fabric – the more room you will need for the hook and eye. Because every zipper needs a hook and eye at the top, right? Right! Make sure the zipper is face down on the right side of the fabric, and stitch one side of the zipper. Doesn’t matter which side; you pick. Life is easy if you are using the invisible zip foot for this stitching, because the foot “rolls” the teeth flat so the stitches go in exactly the correct spot. If you can’t figure out how to position the second side of the zipper in place without getting a twist in it; zip it up. 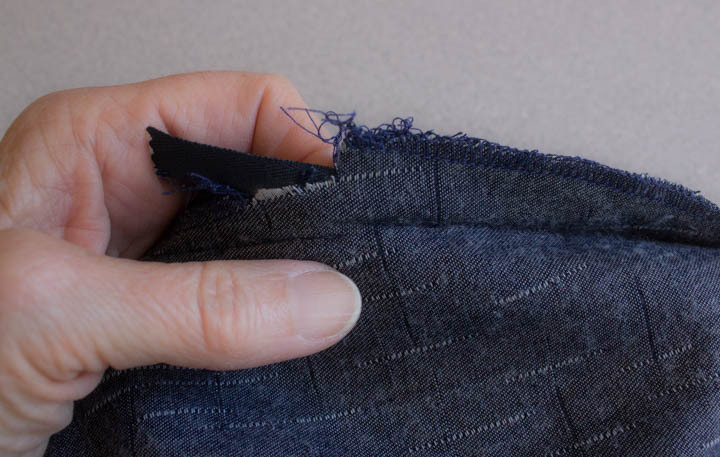 Then lay the second “zipper opening” edge on top of the zipper with the seam allowance folded to the wrong side. Flip the whole mess over, unzip the zipper, and align the teeth to the chalk line. You can always zip it up again and look at it from the right side to make sure everything is hunky-dory before you start any stitching. Before you stitch the second side of the zipper, change to a basting stitch, and baste only the “horizontal join” areas of the second side. For the Emily, this means the top edge, the yoke/pant seamline, and the bottom edge. 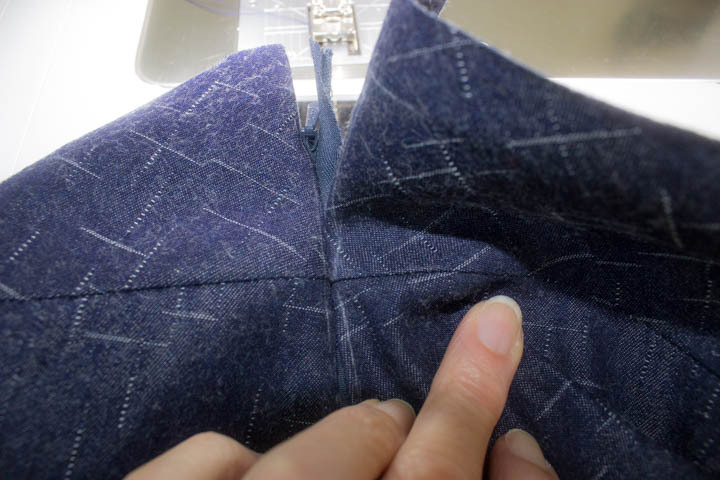 The idea is to make sure your stitching is perfectly symmetrical on both sides of these horizontal alignment areas before you stitch the complete zipper in place. If the 2 sides do not line up correctly, it is a bazillion times easier to just rip out a few basting stitches. Keep at it until you are satisfied with how it looks. (I have been known to rip these basting stitches out 4, 5 or even more times if I am using tricky fabric. But it is fast and easy to redo, and worth it in the final product.) Then stitch the second side completely with the same stitch length used on the first side. 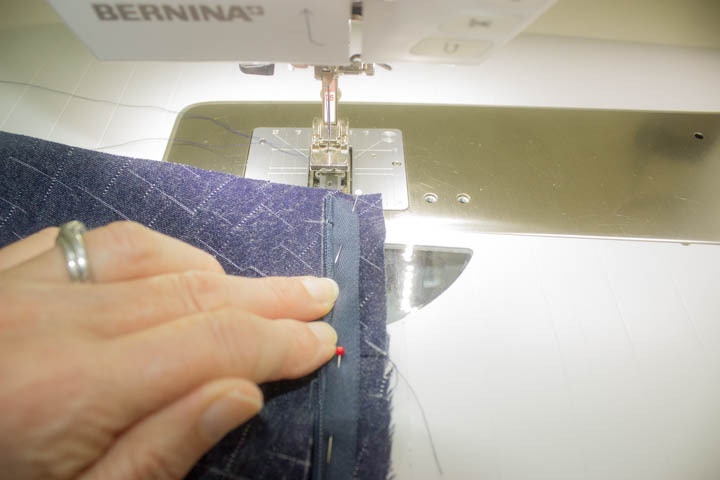 Using a regular zipper foot, sew from the bottom hem of the left side up to where the zipper stitching ends. Ideally, you want to go 1 or 2 stitches beyond the zipper stitching, and very slightly towards the garment. It really helps to chalk this stitching line, at least an inch or two below the zipper. Do not try to perfectly align the seamline stitching and the zipper stitching; they will not align. But you do want them to be as close as possible. Chalk line marked 7/8 inch from the raw edge of both sides of the zipper opening. Chalk line marked on upper edge of yoke, accounting for enough space for a hook and eye to be added. 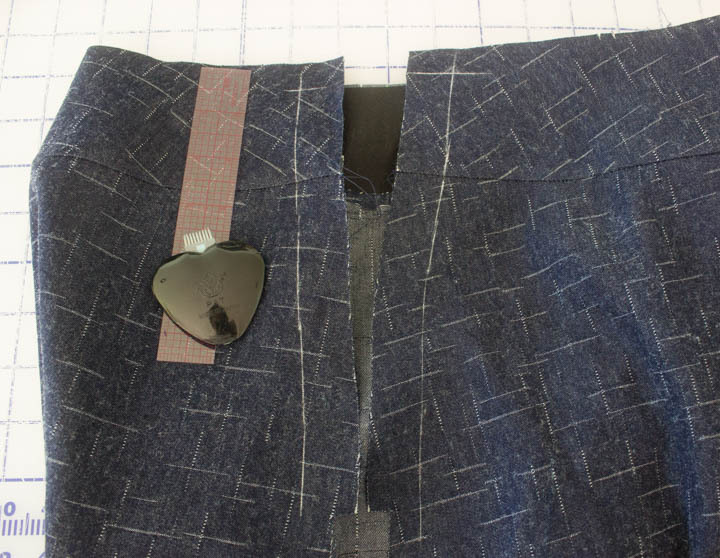 The first side of the zipper is pinned to the culottes, right sides together. Notice that the teeth are toward the garment, and the edge of the zipper tape is toward the seam allowance. Lining up the zipper teeth in the left side of the invisible zipper foot to stitch. Checking that the horizontal alignment of the yoke seam is perfect (enough!) with a few basting stitches across this section of the second side of the zipper. Both sides of the zipper are stitched, and the top, bottom, and yoke seamline all align correctly. Yay! See how the left side seam stitching is very slightly “below” (from the perspective in this image) the zipper stitching? And the side seam stitching only extends about 1 stitch beyond where the zipper stitching stops. Bam! Press the zipper over a ham, and nary a bulge, pucker, or ripple to be seen. You’re welcome! 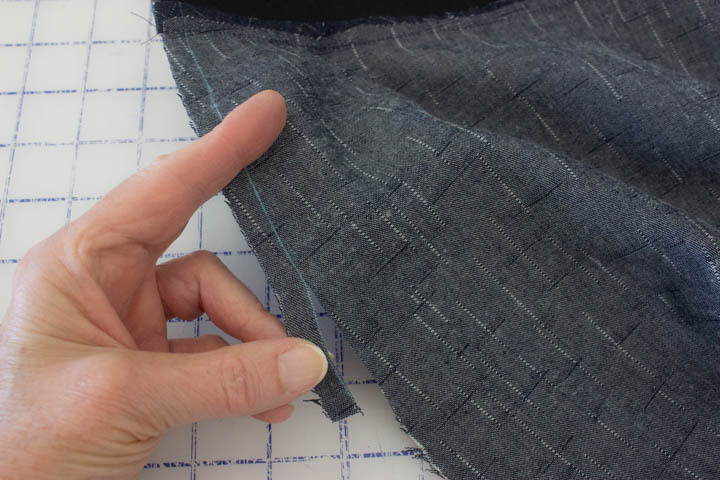 Stitch up the right side of your culottes, finish the edges, and press both the left and right side seam allowances open. Easy peasy, right? 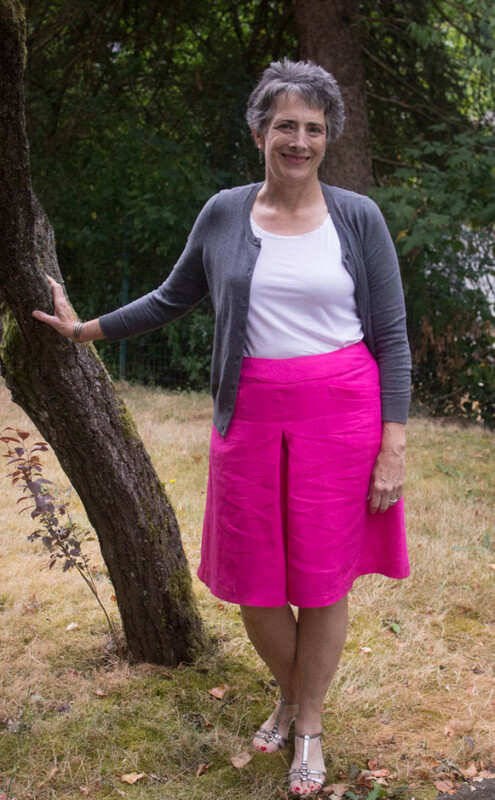 Can you believe you only have to add the yoke lining and hem the culottes? This version is such a quick sew; I love it! 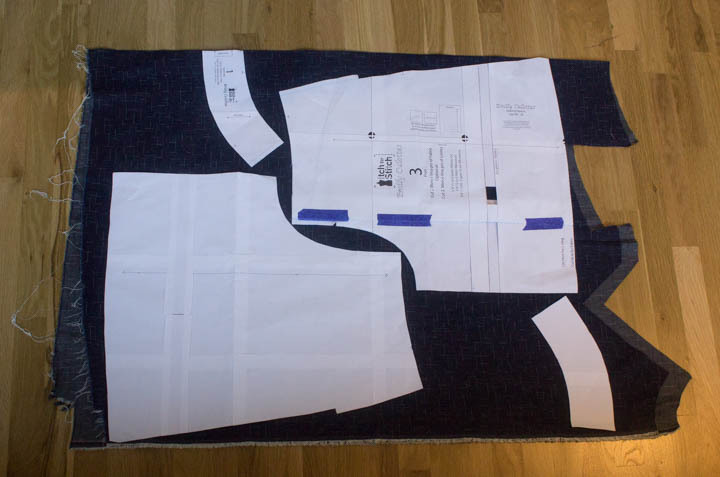 Today you are going to remove the pleat from the Front pattern piece, cut out your culottes, and complete the basic construction up to installing the zipper. Sound like a lot? Really, it is no more than a couple of hours of work. I promise! 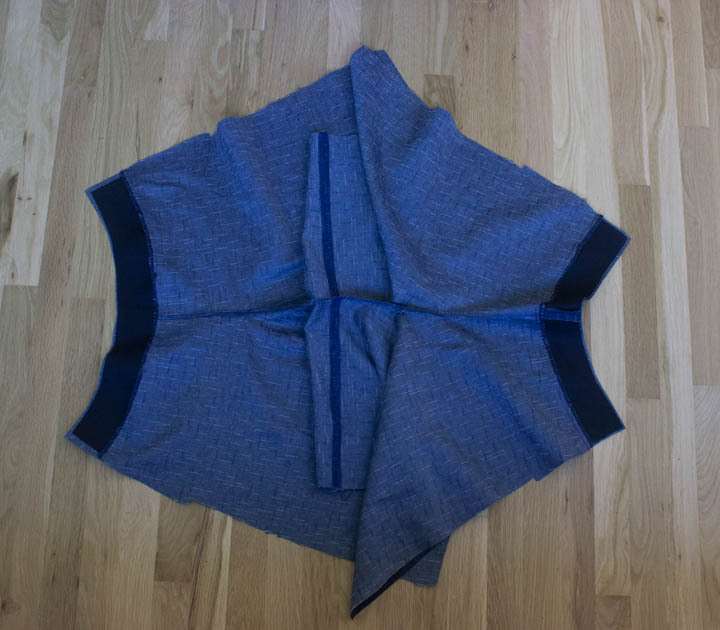 Fold the Emily Front (#3) pattern piece along the blue, dashed pleat line that is farthest from the center front. Bring this folded line to the pleat line closest to the center front, making sure both lines meet up exactly. Tape to secure. Use a temporary stick tape (blue painter’s tape is easy and cheap) if you plan to make a pair with pleats someday, or cellophane tape if you will never use the pleat option. This is also a good time to decide if you want to make your culottes longer or shorter than they are drafted. All sizes are 22 1/2 inches long, so you can measure a skirt or hold a tape measure against your front to decide if you need more or less length. My first pair were a smidge short, so I added 3/4 of an inch to both the Front (#3) and the Back (#4) pattern piece. If you have never done this kind of adjustment before, please read this blog post about pattern adjustments. It refers to changes for a shirt pattern – but the concepts apply to all patterns. Cutting out an unlined version of Emily culottes is fast and east. That’s good because cutting out is not my favorite part. ;-) You only need four pattern pieces; Front Yoke (#1), Back Yoke (#2), Front (#3), and Back (#4). See my blue painter’s tape where I folded out the pleat on the Front? Also the extra length inserted? 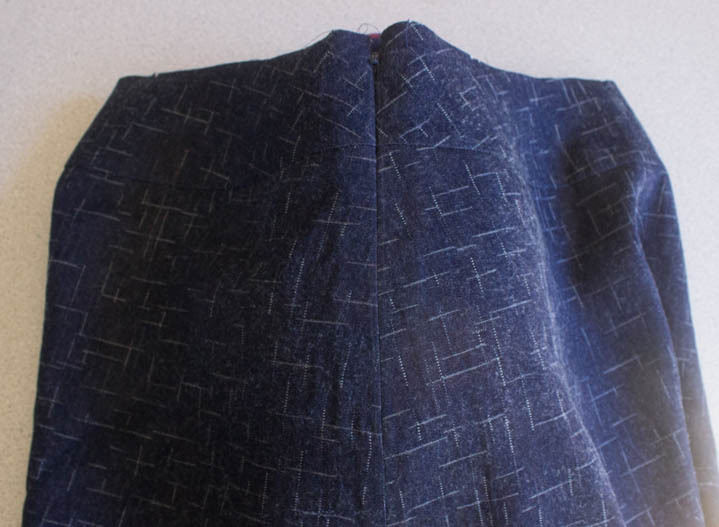 I was able to cut this pattern out of a leftover remnant of denim from a jacket I made a few years ago. I had to squeeze a bit, but I got it out. One pair of Fronts, one pair of Backs, 2 Front Yokes on the fold, and 2 sets (4 total) of Back Yokes. Also, you will need to interface the yokes, so be sure to cut one Front Yoke and a pair of Back Yokes from medium interfacing. 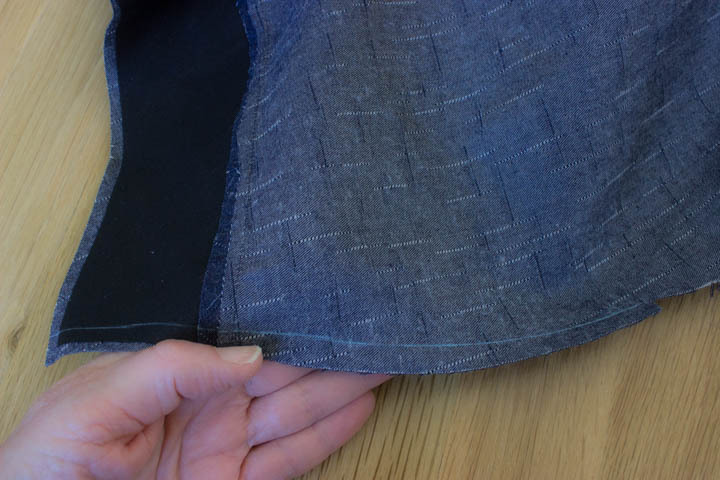 Now, Kennis shows you a very couture interfacing technique (starting on page 13, instructions 1 – 8), taught by people like Marla Kazell and other fancy-pants sewing teachers. It works very nicely, and provides a lovely finished lower edge to the interfacing. BUT. It only makes sense if you are planning on following her directions to use the interfaced yokes on the inside, which I do not do on my waistbands/yokes. 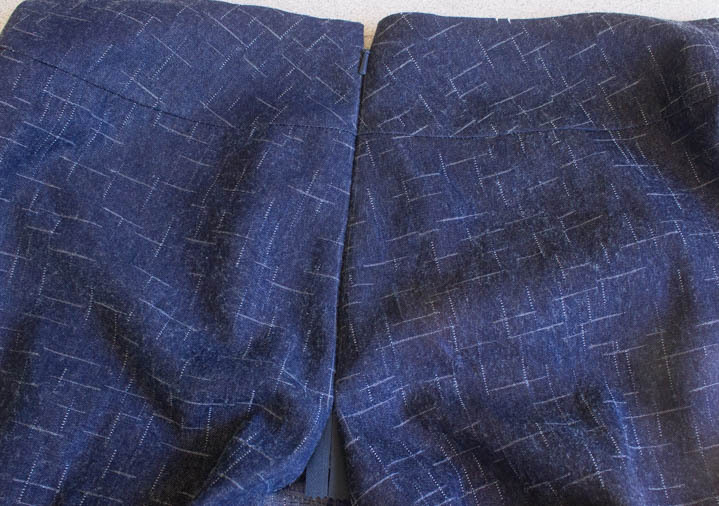 I also skipped the Front Patch pockets because I don’t need any extra fluff in my front, and decided to try out the welt pocket in the linen-blend version. Your call—add ’em if you like. I do kind of miss having a pocket in these, so if I can find a scrap of leftover fabric I might try a jeans style pocket on the back. So if you are skipping the finished edge interfacing technique, the Patch pockets with Buttons, and the Welt Pockets, jump all the way to instruction 48 on page 19. We are ready to sew! If you have ever made a pair of pajama pants, these instructions should look very familiar. Right sides together, sew the inseam of 1 Front and 1 Back. Repeat step 1 for the second side. Press both seams open, and finish as desired (I serged). Right sides together, sew the crotch curve, aligning all edges, notches, and the inseam. Note: I did not press the crotch curve open as suggested. Instead I just serged the curved seam and pressed to one side, because, well, that is just how I always do it. That curve is not really going to press open very well without clipping/weakening the seam, so if you have a serger this is a good use for it. If not, I would stitch with a straight stitch, trim to about 1/4 inch, and then overcast or zig-zag the 2 edges together. My 2 cents. Now skip to step 52, since we are making the plain front version. Right sides together, stitch the Front Yoke to the Front. Right sides together, stitch the two Back Yokes together, and then stitch to the Back right sides together. Note: I deviated from Kennis’ instructions here too. She applies the non-interfaced yokes to the Front and Back. I like the interfaced side to be the public side of my waistbands/yokes, because I don’t want this part of my garment to “crumple” when wearing. And now you can see why I didn’t bother with the interfaced edge finish in steps 1-8; there is no value because the interfaced bottom edges of the yokes are stitched to the body of the garment. 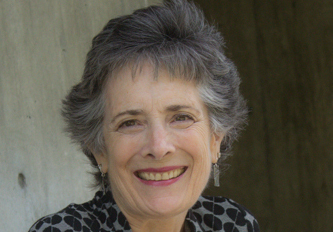 Like many things in sewing, neither method is right or wrong—just personal preference. This image shows all the completed seams. The inseam is the vertical line right in the middle, the crotch curve is the horizontal seam in the center that is serged only, and the interfaced yokes are attached to the Front (left side of the image) and Back (right side). I think this was about 15-20 minutes max of stitching. Instruction 55 has you trim off the “extra” zipper seam allowance on the right side only of both the Front and Back the culottes, since the zipper is on the left side. I like to draw a chalk line 3/8 from the raw edge so my cutting is accurate all the way along that curved seam. Next up, inserting an invisible zipper. Which is the easiest, fastest zipper to install, IMHO. Alright friends, let’s get this awesome Emily Culottes party started! I am really excited about this wonderful pattern from the talented Kennis Wong. I have already made up 2 pairs, and have plans for at least one more pair. So.Comfy! Hopefully by now you have purchased your own copy of the pattern, but if not, be sure to do so very soon. In my earlier post you will find the “secret” coupon code that saves you a whopping 30% on your pattern, which is good through August 2nd. Thanks, Kennis! Be sure to use the Adobe “Layers” functionality to print out only your size. Kennis has diagrams and great instructions on how to do this on page 7 of her written instructions. Check the “Actual Size” or “Scale to 100%” option on your Print dialog before printing the pattern tiles. Page 8 of the pattern instructions shows you the arrangement of the tiles so you can tape/glue the paper together in the right order. It is way easier than it may appear to you newbies. Trust me! I use a liquid gel glue stick rather than cellophane tape to assemble my pattern. Saves.So.Much.Time. There are loads of other types of glue sticks, and I am sure they all work fine. Do not bother printing the instructions. The pattern tiles are located on pages 27 – 49, so those are the only pages I print. I always just read the construction info on my computer – saves a tree or two. Have you joined our Facebook group yet? It’s a fun way to ask questions and chat with others who are sewing up Emily Culottes, too. Have you bought fabric, or better yet, are you using something out of your stash? Kennis recommends medium or “bottom-weight” fabrics. If you plan to use a fabric with stretch, it should be stable with slight stretch – a woven with a small amount of Lycra is probably a good choice. So far I have made 1 pair in denim and 1 pair from something linen-y (or maybe a linen blend – it has been in my stash so long I don’t really know!). The denim has more structure, and the linen-y is softer and drapier. Maybe it has some rayon? Honestly, depending on the look you want to achieve, many fabrics could work (with the exception of something very stretchy like a jersey knit). Pleated front culottes with single welt pockets. An Emily-hack with side front pockets. Yes, I will cover the pattern drafting to accomplish this! 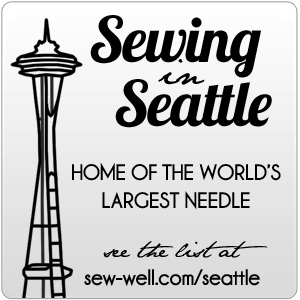 If you have never participated in a sew-along, the idea is you sew along with a community, and share your tips and questions with the group. That is what our Facebook group is intended for, but if you are not a FB user feel free to leave comments in the blog. If you get behind, don’t sweat it. All you have to do is pick up the blog posts again as soon as you can. The blog and FB group will still be accessible, so don’t let this project be the thing that pushes you over the edge. This is supposed to be FUN! If you tweet or use Instagram, be sure to use the hashtag #sewmarisemily. That way we can all find each other’s posts. Fun times, and thanks so much for joining in!! Ready for an Emily Culottes Sew Along? Are you itching to make a trendy pair of culottes to wear this summer, or beyond? Kennis Wong (the very talented designer behind Itch to Stitch ) released the Emily Culottes PDF pattern earlier this year, and I was immediately smitten with her take on the culotte/skort/bifurcated skirt look. It’s adorable, right? 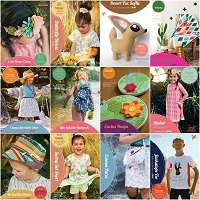 The sew-along will start up on July 27th, so that should give you plenty of time to purchase your pattern and supplies. I will make several different versions of the Emily culotte, and of course, I have a trick or two of my own to throw into the mix. There will be a special Emily Culottes FB group, and we can create a Flickr group too if that is easier to post your pictures. Get ready! 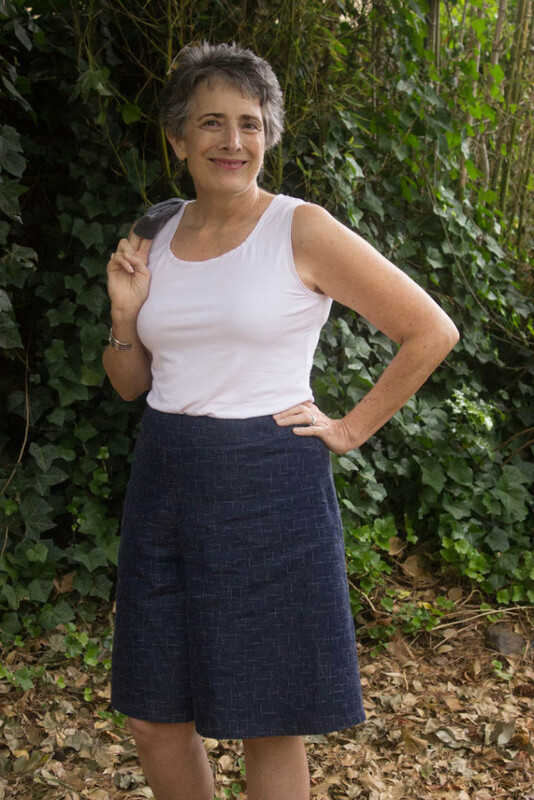 On July 27 we are taking off on the Sew Maris Emily Culottes Sew-Along!